Bold New World High Contrast Playmat is rated 5.0 out of 5 by 22. Grab your little one’s attention with the eye-catching Bold New World baby mat from Baby Einstein. High-contrast colors and patterns make it easier for baby to focus on her surroundings while her eyesight develops. The adjustable canopy can be moved to baby’s level, making tummy time more comfortable and fun. And the plush prop pillow gives baby the support she needs as she checks out all the engaging patterns and shapes around her. Hide and reveal toys, like the magic apple that turns inside out, keep baby curious, surprised and delighted. As baby grows, so does the play gym. Flip the canopy to reveal a whole new side of bright colors, or adjust it for different ages and stages. Lower the canopy to baby’s eye level during tummy time, create a colorful sky overhead during lay and play on baby’s back, or move it anywhere in between during sit and play time. Move around the take-along toys so they’re always in baby’s reach no matter the play position. Watch your little one’s eyes fill with wonder as she explores a mat filled with fun surprises. Rated 5 out of 5 by Bree from Great for babies! This has been absolutely perfect for my newborn. We attempt to do tummy time a few times throughout the day and the mat allows for a safe place to do so and has cute features that my daughter really enjoys like the canopy with toys and the cute supportive pillow. Rated 5 out of 5 by Courtney B from Perfect everyday accessory! Our daughter plays on this mat all the time! It's, hands down, one of the best accessories that I recommend to my friends. Our daughter has used this since she was a few weeks old up until now (6 months), and I know she will continue to use it in the coming months. In the early days, it's great for babies to lay on their backs and look up at the fun toys. When babies start to sit up, you can adjust the bars, put some toys on the mat, and they'll entertain themselves for quite a while. I highly recommend this product! Rated 5 out of 5 by Danyellxo from Bright and Bold My 8 week old twins love tummy time and floor time. I believe its because the bright bold patterns and colors keep them engaged. This is different from your normal run of the mill playmat. You and your baby will not be disappointed! Rated 5 out of 5 by lesliet2345 from So much fun My 3 month old really enjoys this play mat. It is such great contrasting colors- he just looks at it and takes it all in. Smiling constantly while on it. It was easy to put together and seems to be well made. Easy to clean up after he spits up on it too. So happy with this product. My only complaint would be that because of the slippery material, the pillow does not stay put for him, it just slides around. but, I assume this will not be as much of an issue once he gets better head control. Rated 4 out of 5 by Mast from Bright and fun playmat! This is a really cute mat with many great features. The bold and bright colors are stunning. Perfect for new babies (black and white), and growing infants. I love the different activities it comes with: a mirror, a triangle shaker toy, a pillow for tummy time, a little book and a "surprise" apple that turns inside out to make a black and white ball. The canopy in top provides a fun view for babies. It slides over the arch so you can reposition it. Putting it together was my only complaint. It was kind of a pain and two of the plastic inserts (pictured) did not fit inside the canopy as directed so I had to cut them myself. Otherwise it is a really nice activity mat that will grow with baby (my 12 month old still loves it!) and I definitely recommend this product! Rated 5 out of 5 by bvickrey from Baby Einstein - Bold New World™ High Contrast Play Being a grandparent I am always looking for something for my grand-babies that I can use when they spend the day with me. When I took the Baby Einstein - Bold New World High Contrast Playmat out of the box I just feel in love with the bright colors and the black and white contrast. I knew this would be great for my grand-babies and would be great in helping with development. The mat is one of the more plush mats I have come across. The size is perfect for transport and the toys are fun and eye catching. My little grand-baby especially loved the mirror. 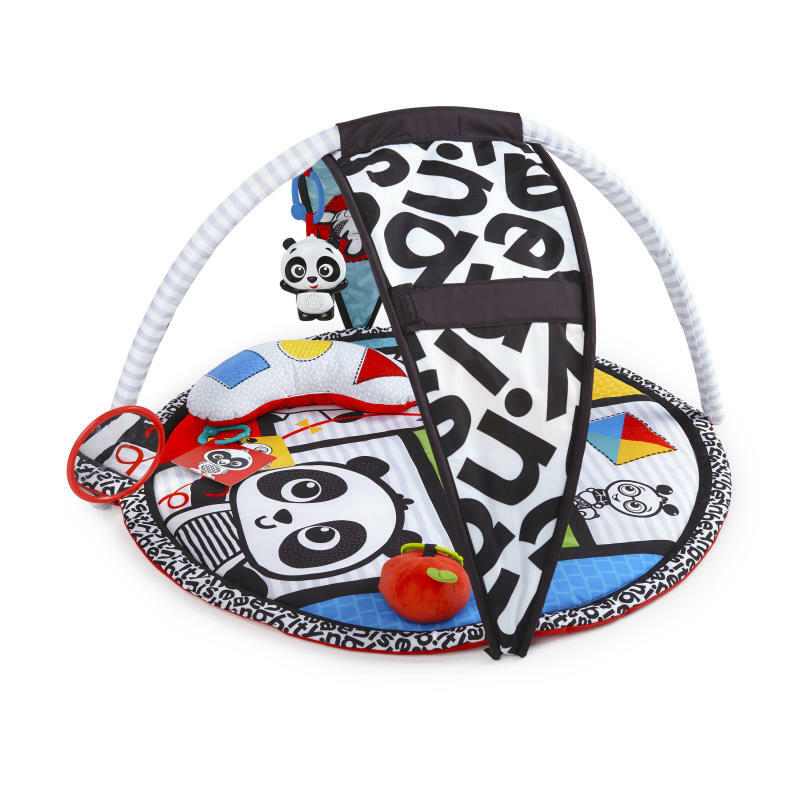 The Baby Einstein - Bold New World High Contrast Playmat will make a great baby shower gift, I would recommend this to my friends and family. Rated 5 out of 5 by Rossed from Wonderful contrast for little eyes! This mat immediately caught my baby's attention. The black and white contrast is perfect for their eyes. It is softer and more padded than other mats we've used and that is perfect for use on our rugs that are over hardwood. My baby loves the little panda that comes with it too!